In case you’ve missed our 100th Day journey, be sure to catch up on our previous conversations here. And then stay tuned to read about what actually happened–spoiler alert: it was AMAZING!! We began the day much like we normally do, with our regular routine of washing our hands and then working on the math apps we use every day: Front Row and Dreambox. I got together some supplies, Tyrin took our pizza orders for lunch, and then we all got together to start our 100th Day of School. We had narrowed down our choices to the ones that most closely matched our purpose for the day (reflecting upon or thinking about learning), but still we would not have been able to do all of those things in just the time we’re together on a normal school day, so I had to whittle it down even further. Also, since we had come up with the SUPER list from our Little Red Riding Hood book as well, we actually had a new (and pretty big) job that we had added. 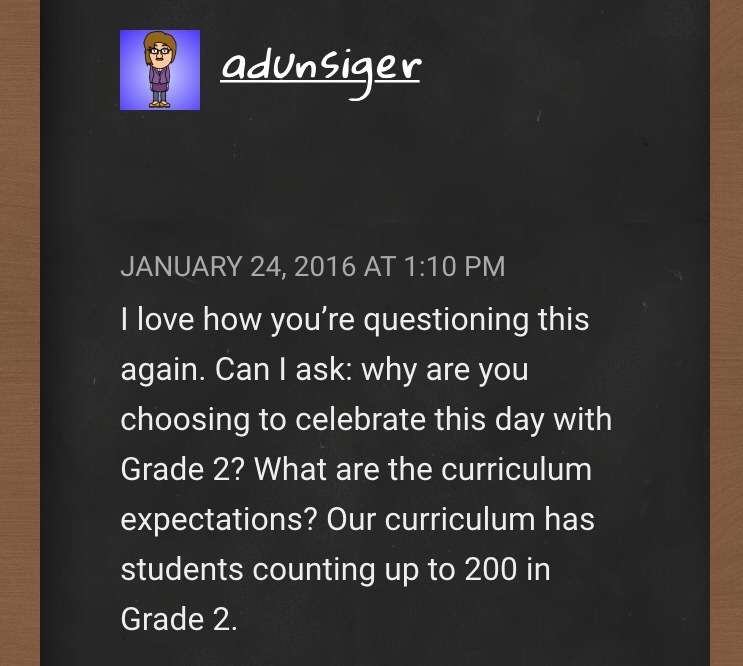 And since I can’t leave well enough alone, I gave them one more reminder about how this wasn’t truly our “100th” day, so we did a little bit of math: 176 + 176 + 100=452, meaning we were actually celebrating the 452nd day we had been in school! WOW! Too bad we couldn’t have had a whole list of activities related to that number! First, I gave them a framework for book that we had decided to write together about our 100 days of 2nd grade and how much we had learned. There were stems on each page that kiddos were supposed to fill in, and since we were doing it on our iPads, they could use pictures from their camera roll, drawings (that would then be added by taking a picture), typing or writing on the pages. We use a Learning Management System called eBackpack to give and receive work, so they were to work on their pages (each kiddo was given 5) and then send them back to me. Once they got started working, I began to call small groups over to start making muffins (based on our super smart ideas from Little Red Riding Hood: A Newfangled Prairie Tale by Lisa Campbell Ernst) to share with our 2nd grade friends. There are conveniently (if you’re connecting to the number 100) 101 kiddos in our grade, so we had a lot of baking to do; we had figured out through some HARD work the day before that we needed to make 9 batches in order to have enough. Wow. Well, thankfully, my friend (who typically comes to help us during Math on Thursdays anyway) was free in the morning today, because looking back now there is NO WAY we could have made 100 muffins with 21 kiddos with just me. Thanks, Mary Beth! She took one table and I manned another one and we measured and poured, stirred and scooped and ultimately took all of our muffin tins to the Robinson kitchen to be baked. Again, if not for Ms. Denise in the kitchen who took charge of the ovens, we wouldn’t have had any muffins. She was a lifesaver today. Although I would have love to add pictures of the many trips we took to the kitchen and back, and share a picture of Ms. Denise, as well as how beautiful our muffins were while they were baking, I was carrying muffin tins and opening doors and having to be a teacher (hee hee), so you’ll just have to imagine that part. I also wish there was smell-o-vision so I could share how wonderful our muffins smelled while they were baking (believe me, I was told my multiple people that they could smell them all over the school! ), but alas, not this time. Just imagine the most amazing aroma ever and that’s what it was like. 🙂 Ultimately we only ended up making 8 dozen (not sure what happened there), so we had to do some quick math about our shortage (which was a great lesson in scarcity!) and figure out how we could best share with our friends as well as have some muffins for ourselves. we made some plans for how we’d get them to our friends. We agreed (ok, well they did after I convinced them) that it was the right thing to do to give muffins to the other 2nd graders before we served ourselves and so we go together in groups and created little pitches to share with them about what we did and how we wanted to give so to them. Because our day was filled with two other special events (roller skating in PE and a farewell assembly for a beloved custodian), we only had time for one more thing, and we decided it should be puzzles. After that conversation the other day and the question from Ja’Mia, we knew it would be fun, hard work and would definitely allow us to use all of the grit, patience and teamwork we’ve been building lately. Look at what we were able to do! Whew! Our 100th day of school was today! Boy am I tired! WE WERE BUSY!! If you were writing down a list of what we accomplished today, it would just say “blogging.” I even had a kiddo say, “All we did was blog today, Mrs. Bearden.” What? That’s ALL we did? In a word, yes, but MAN was there a TON of learning and thinking involved in that day of blogging! I am SUPER AMAZED at what we were able to do today. I started the day by telling my friends that I had prepared several challenges for them to do and that we could spend the day with those things. We usually start our day with writing, so I shared the writing challenge first, with plans to share the rest of the challenges as we went on through the day. The first thing we planned to work on was a blogging challenge. 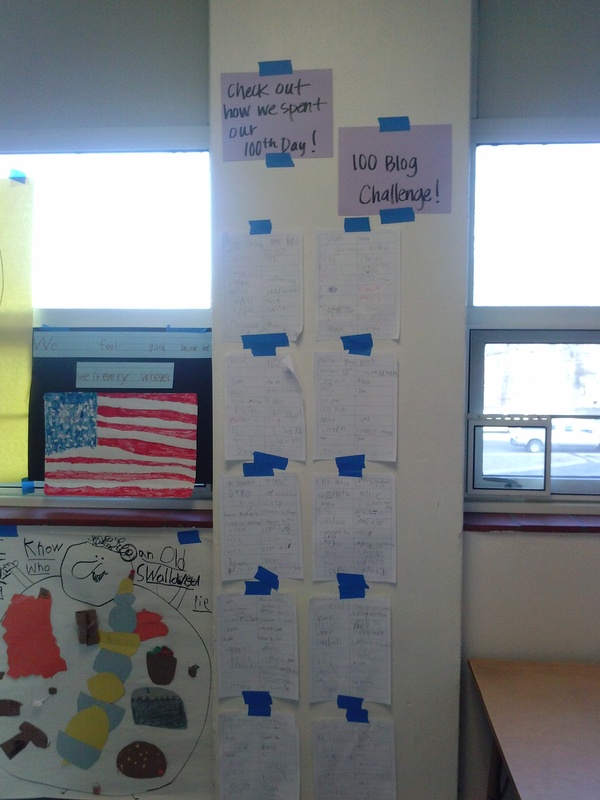 With it being the 100th day of school, and the fact that we just went live with our blogs yesterday, I knew they’d appreciate a challenge around the “bigness” of 100 things on their blog. I suggested we try to write 100 blog posts or comments. Or they could challenge themselves to write a post using 100 words (which would be a HUGE STRETCH from the 2-3 sentence posts we’ve written so far). As I had hoped and expected, they were SUPER excited to get started, and were totally up to the challenge! Our next step was to figure out how we could make it happen. This was a great conversation filled with much mathematical knowledge of groups of 10, counting on by 10s (as I told them we had 17 posts right then and wondered how many there would be if we added 100 more today), and splitting 10s into 5s to figure out new groups (someone said they knew that if it took 10 10s to make 100, it would take 20 5s since 5+5=10). We divided (without knowing it) 100 by the 20 people in the room (including me! ), and as we went through the challenge we did lots of adding and subtracting to figure how many more we needed and how many we had at any given point. It’s a little hard to see, but these are the charts where we kept tally of all of the posts/comments we finished. We counted them by 10s, 1s, and 2s at several points during the day as we figured out what we’d done and how much we had to go. It hangs outside our room for others to see. I’m hoping it will elicit questions for my kids (and for me) about how we spend our100th day! We have a great story to tell! Yesterday we had 17 posts and 0 comments! Check out those numbers as of tonight! We have only been on our blogs since yesterday morning–crazy, right? We’re rocking and rolling already!! 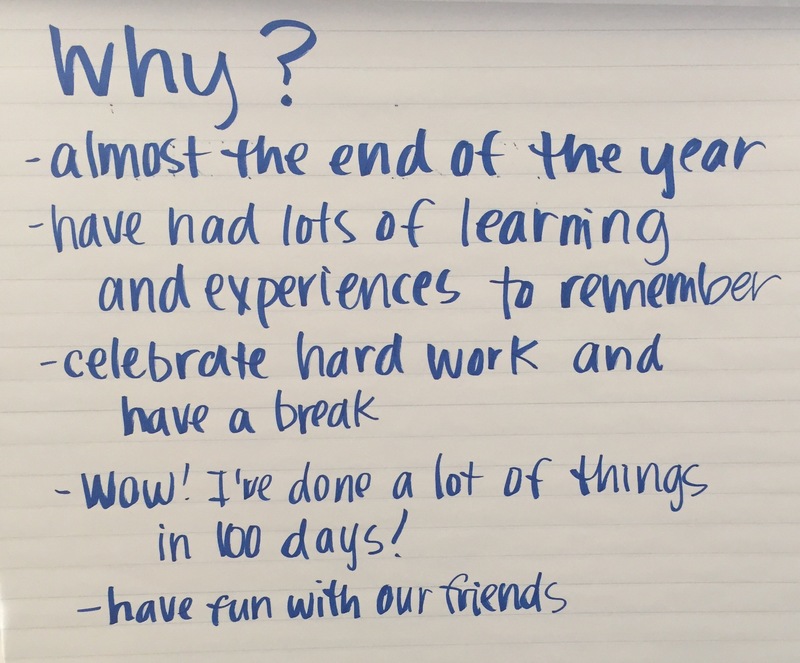 I found myself nodding as I read her post, as she was asking the same thing I have been struggling with: Why do we “celebrate” the 100th day of school? What is the purpose and how can we use this day to continue to help our kiddos think and grow and problem solve? Why is this day any different than every other day? I’ve read many opinions about how it’s a rite of passage and a fun day to celebrate the milestone of getting so far into the year together, and I’ve heard others say it’s about helping students understand the “bigness” and importance of the number 100. Believe me, I’m all for having a great day, and I LOVE the idea of kids understanding numbers and being flexible in their use of them. So the part I’m grappling with is how I can “do” the 100th day in a way that is still high quality and rigorous, while fun and enjoyable–and not just full of things that are “cute” or that we’re doing “just because” they have to do with the number 100 (and let’s be honest–this is really our goal for every day, isn’t it?). 1. 100 Book Reading Challenge–with my “big” kids, we have done a 40 Book Challenge the last few years, after reading about it in The Book Whisperer by Donalyn Miller. I would love to give my firsties a similar, one-day challenge for our class together to read 100 books. It averages out to 5 books a piece or so, which is TOTALLY doable, and would be a great motivation to reach a goal and work on being better readers. That’s how it happens, right? By reading! I figure we’ll make a chart or list somewhere in the room so we can record the titles as we go. 3. What Have We Learned in the Last 100 Days?–Taking inspiration from Aviva’s post, I thought it would be great to document all of the things we’ve learned and done in the last 100 days (which I am sure is WAY more than just a 100) with pictures and words. Since I’m a regular blogger, I am also a regular picture-taker. That means I probably have at least one picture from each of our 100 days together. I’m thinking about having kiddos reflect on each day (probably in pairs) and writing something to go along with each picture. These could be put into a book (either paper or digital) and we could add to it as we finish up the year. Again, what a great way to visually see all of the many things they know now that they didn’t know on our 1st Day together! 4. Legos? Blocks? 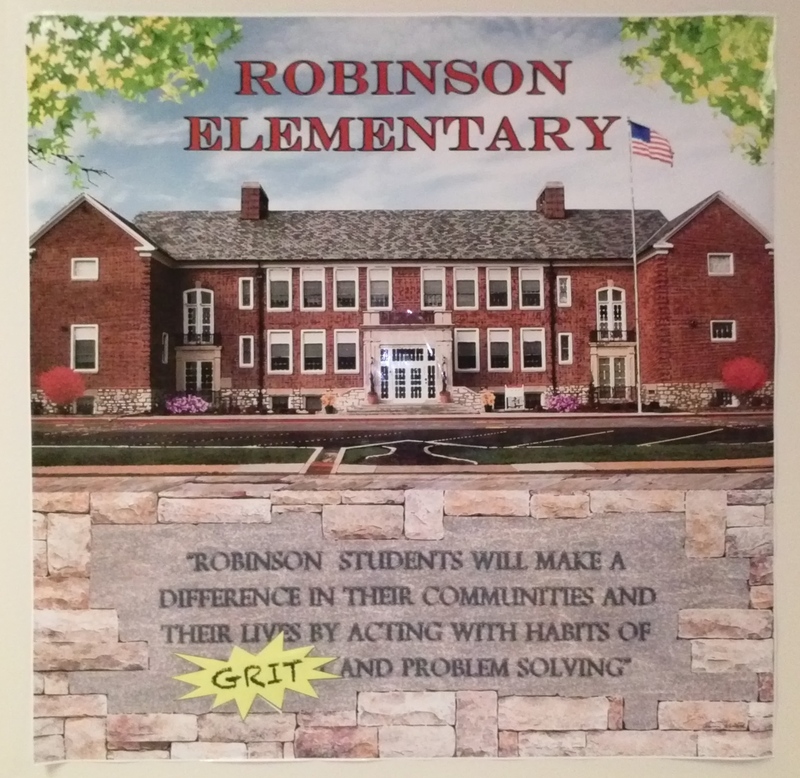 Maker Space?–We are definitely builders in Rm. 202, and incorporate this kind of representation into many things we do on a regular basis. I have seen ideas for “what would you do with 100 Legos?” which could be interesting, as they could answer the question about what they’ve learned or what they are most proud of. We did something similar when we returned from Winter Break where they created and then wrote about their favorite thing/event/present from Christmas. I’d love to give them the same question and have them build something with big blocks or just “stuff” and then have them video their thinking as they explain what they made and why. The video part would be pretty basic, as we’re just getting into documenting our learning digitally. Those videos would be great to share on our blogs–which we’re going live with this week, too! 5. 100s game in Math–this will be an easy extension of what we’re already doing! The unit we’re currently working on is about kids become flexible and efficient with adding numbers within 100. We’re already playing games, solving problems and having great conversations about place value with bigger numbers. 6. Read Aloud–I know that Read Aloud has been a focus around here lately, so maybe we’ll read 100 pages in our book on Wednesday, too, as a way to celebrate a great story together! I guess we’ll see what I end up going with (as it will happen in just 3 days from now!). I’d love to hear your thoughts on how YOU will be spending the 100th Day of School. What questions did you consider in your planning? Please come back later this week to see the update on what actually happened in Rm. 202, and/or follow us @jbeardensclass to enjoy the day along with us!